This topic contains 3 replies, has 2 voices, and was last updated by Billy 4 years, 1 month ago. Where is this scene – How many of those snippets can you name? My, My Billy this topic brings back some memories considering I used to travel this route every morning and return every afternoon on my way to and from St Chads college, Fallings Park by Trolleybus. I can only remember the name of the Elephant and Castle pub, I have forgotten the other. 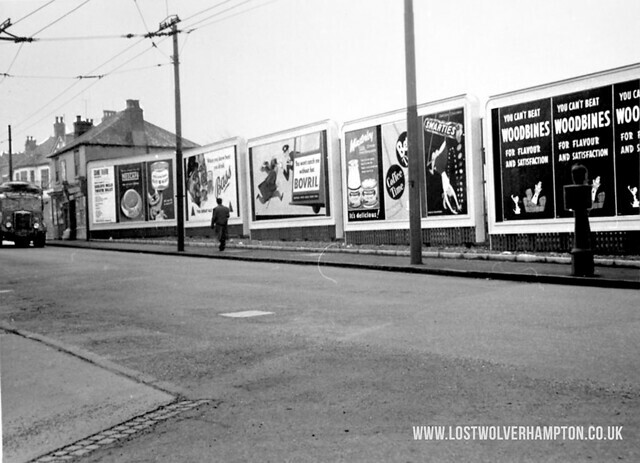 The sports shop belonged to the Wolves winger Jimmy Mullen, I believe he opened one near Monmore green at a later date. Happy days! Nice to hear from you Rob, and yes it holds many memories for me as this was part of my playground You of course have answered two of the questions from this little puzzle. Hi Bill, this looks like the junction of Stafford St & Cannock Rd. The pubs definitely the Elephant & Castle, and possibly the Barley Mow. All correct except the Barley Mow – It was in Lower Stafford Where here on the right corner of Stafford Street and Cannock Road facing the Elephant and Castle seen here on this photograph was The Junction Inn. Doctor Byrne-Quinn, was Mayor of Wolverhampton in 1943. Jimmy Mullens sports shop was at the top of Crescent Row at that time.